As some of you might know, I became co-owner of a 1954 Piper Super Cub, registered G-CCKW last month. Previous blog-posts such as "The little yellow aeroplane" have explained how I enjoy going back to basics with my non-professional flying. Being 60 years old, she is classified as an oldtimer/vintage aircraft. However a friend and fellow airline pilot in Belgium, owns a 1993 Piper Super Cub. One of the last ones that came of the production line. Since both aircraft are based at different airfields in Belgium, we had not been able to photograph them side by side; till yesterday when we both met at the “End of Summer Fly-in” at Lille Marcq En Baroeul (LFQO) on Sunday Sep 28, 2014. Even though there is almost 40 years difference between both aircraft, it is remarkable how close they are, especially exterior. Both of them have the same 150hp Lycoming engine and carry pretty much the same paintjob. More images of the little yellow flying machine can be found here. Remember all pilots; "If you are bored flying, your standards are too low!" First of all, for those of you that might not be familiar with the term "Noir", more specifically "Film Noir"; it is a cinematic term to describe a very specific kind of Hollywood crime drama, going back to the 1940's and 50's. It is associated with a low key black and white style, which often uses darks street scenes. Because Dubai is largely a very safe place compared to other major cities around the world, it is not always easy to find places that lend themselves to making "Noir" images... One such place is Alserkal avenue; a relatively new area which consist of old warehouses that exhibit and sell Art. It's also home to Gulf Photo Plus (GPP); my favourite place to buy photo gear, take a photography workshop of just talk photography! After the latest GPP Photo-talk with Shahidul Alam and Neo Ntsoma last week, I wondered around the area a bit in search for a good place to shoot. 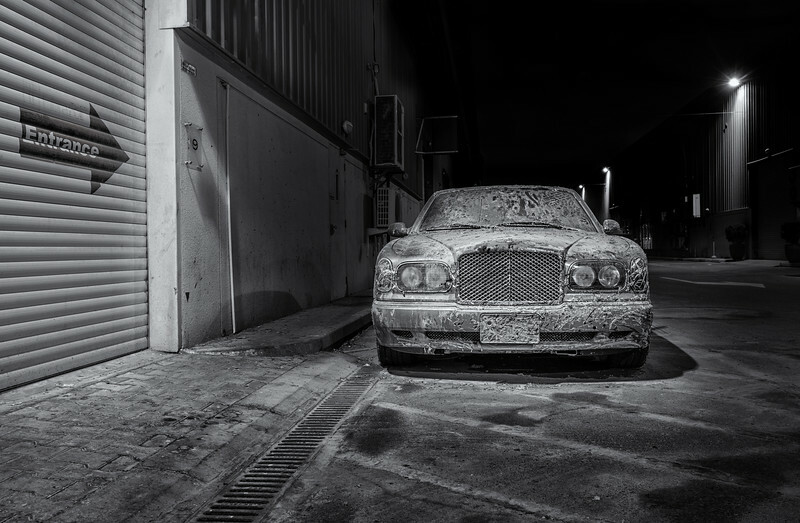 When I saw a Bentley car, which had been painted in half a dozen different colours for some "Art" project, I had found my "Noir" photo subject! Yes, I know; some people have strange ideas when it comes to Art... The fact that the car was parked right under a street lamp made it all that much more interesting. The Canadian Warplane Heritage museum has been in the Aviation news quite a bit lately... Their main asset, one of only two airworthy Avro Lancasters, is presently over on a six week trip to the United Kingdom, where it is joining its sister ship from the Battle of Britain Memorial Flight on the UK airshow circuit. Just as the Canadian Lancaster was being prepared to fly across the Atlantic, I was at this great Aviation museum at the Hamilton airport, about one hour Southwest of Toronto. One of the images shot that day can be found here. As it has been over 50 years that two of these mighty World war II bombers have flown in formation, it is definitively Aviation News worthy! My Pic(k) of the week however is of a 1946 Beechcraft Model 18S; one of my favourite smaller vintage prop-liners. Just like most of the museum collection, it is fully airworthy and ready to take to the skies! 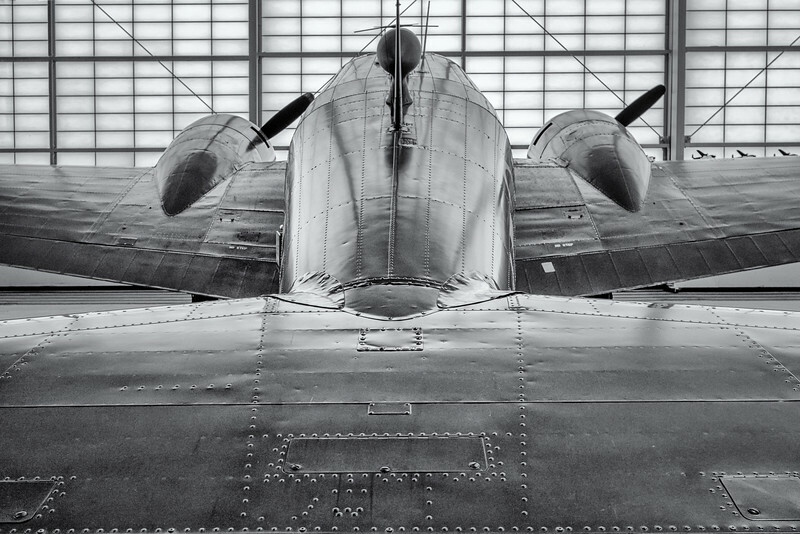 I particularly like how the ambient light falls on the hundreds of rivets that hold together the structure of this World War II transport aircraft. To me, it was an image that was screaming to be converted into Black and White! As the image was shot at ISO 2500 (handheld), with minimal noise, it shows how good the Fujifilm X-T1 is in a low light environment. All Aviation geeks who are close to Hamilton, make sure you don't mis the Canadian Warplane Heritage museum in Ontario! All images of my visit can be found here. While I was in Paris on a 24 hour layover for the flying job, I gave myself the challenge to photograph the 125 year old building in a way that could have been done at the start of twentieth century; no cars, no people, no modern buildings, in Black and White! Given it was the last weekend of August and the end of the Summer holiday period, leaving the people out was probably the hardest challenge. 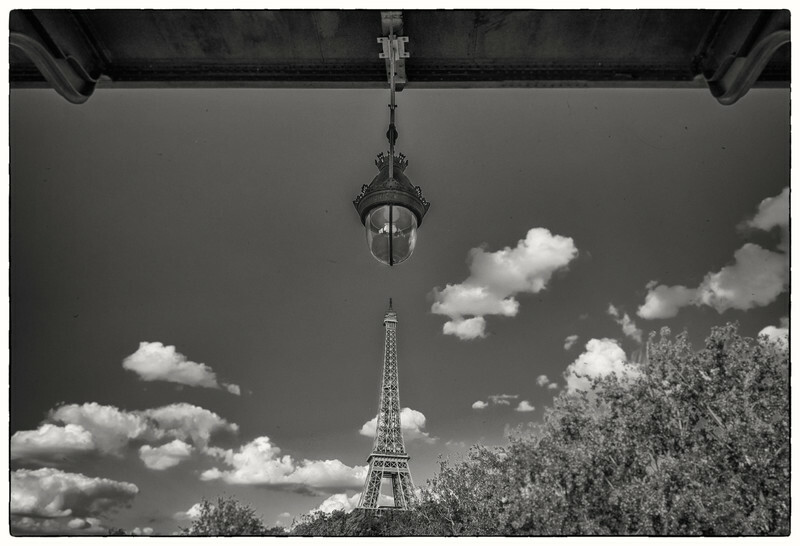 The image above was made under the Bir-Hakeim bridge, a few kilometers to the Southwest of the 324m monument. This bridge over the Seine river, dates back to 1905, 16 years after the Eiffel tower was finished, and has been used in several movies like "Inception" and "last tango in Paris". One of the things that always surprises me is that the height of the Eiffel tower is almost exactly the same as that of the Burj Al Arab hotel in Dubai (324m versus 321m). Over the last few months, I've been on a mission to loose as much weight as possible... not for myself (maybe I should! ), but on my camera gear! As part of my "Bye Bye Nikon, Hello Fujifilm" switch from the heavy DSLR to the compact light weight mirrorless gear, I've now also revisited my tripod set-up. 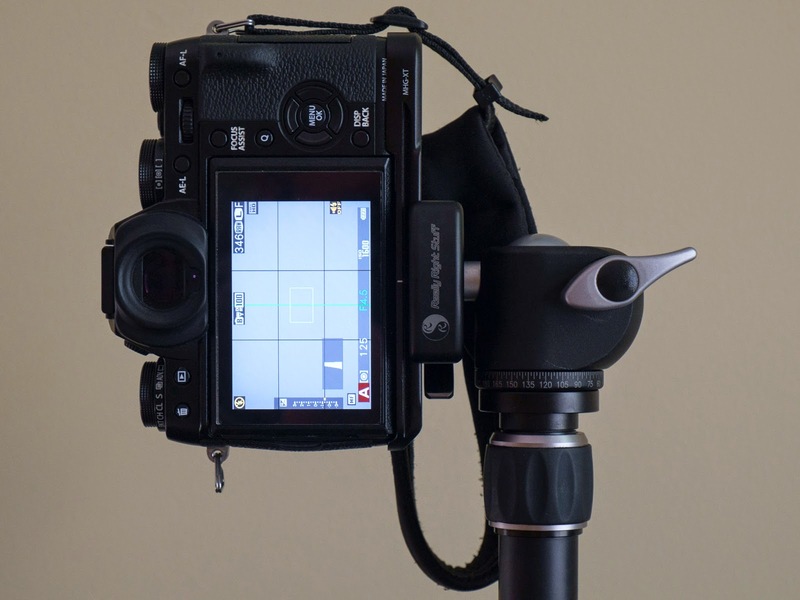 Over the last few years, I've used a very sturdy Gitzo G1257 6X carbon fiber tripod together with a Markins Q20 ballhead. Although they both work great with the X-series Fujifilm cameras, it was clearly a bit of overkill. 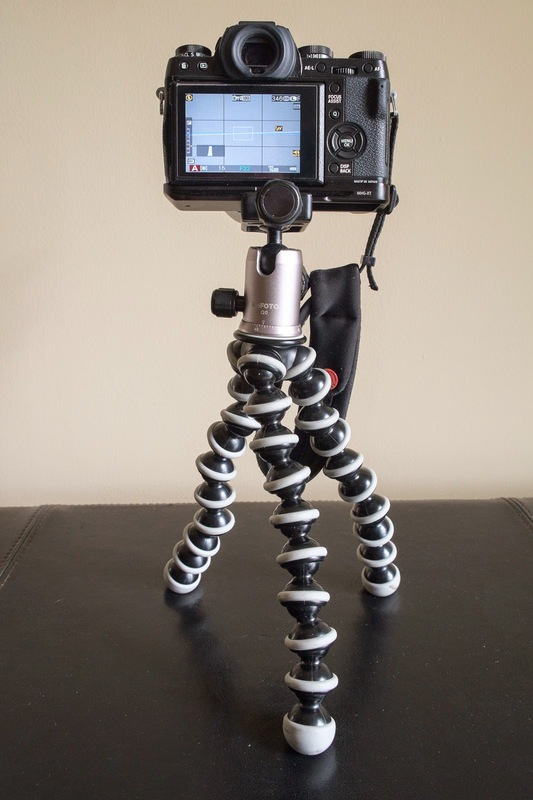 Shortly after I bought my first mirrorless (Fujifilm X-E1) camera, I picked up a lightweight MeFoto Q0350 tripod. 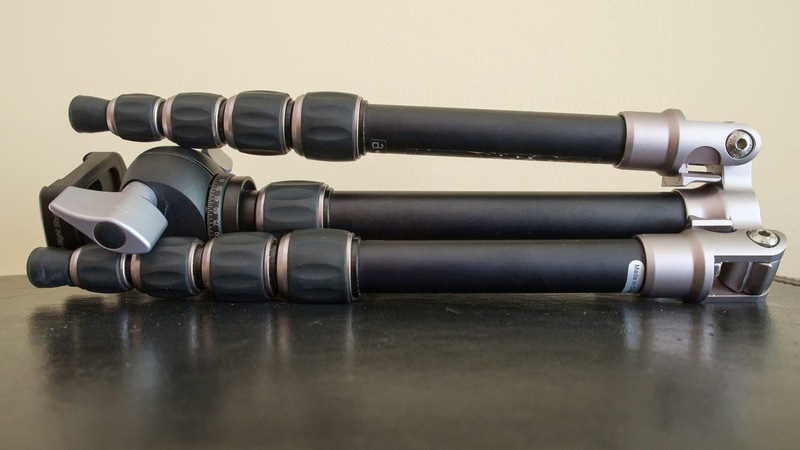 Since then, MeFoto has re-branded their tripods and it is now called the BackPacker series. As of today, it will set you back a very reasonable 150,-USD. 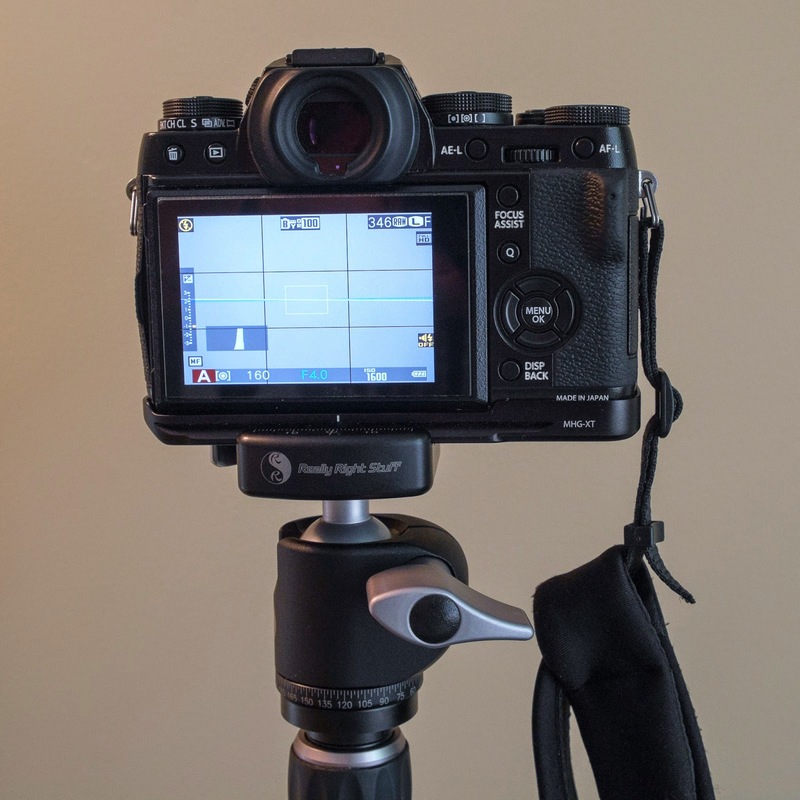 Folded, under 30cm (12inches) long, it is perfect as a travel tripod and offers great stability with the X-T1 and 55-200 lens; probably fuji's heaviest camera/lens setup for the time being. The MeFoto tripods come with its own detachable ballhead (image above, left) but I find these a bit too flimsy to deliver quality work with the heaviest of my mirror-less kit, especially in windy conditions. 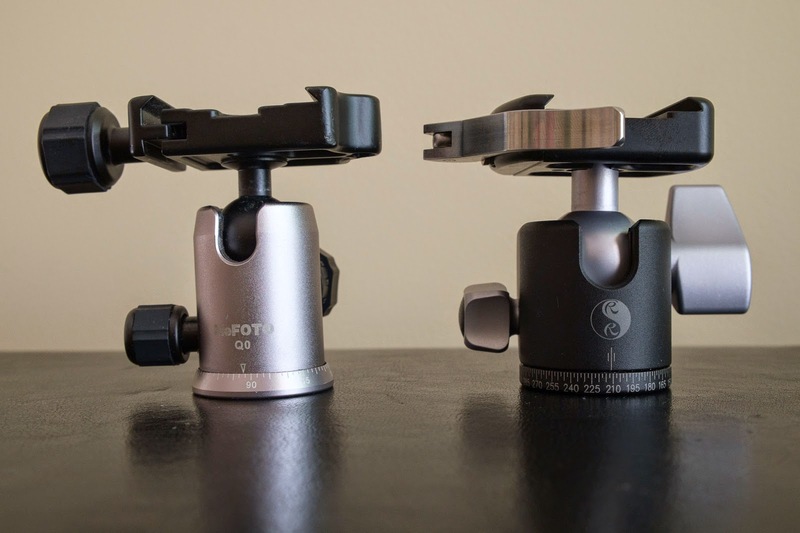 Now I must say that I did not have the opportunity to use the lasted versions of the MeFoto ballheads, as mine is over a year old and improvements have likely been made. Anyway, it was time to look for a higher quality ballhead with about the same size and weight as the MeFoto one. Likely the best place to look for ballheads is Really Right Stuff (RRS) and it quickly became clear that the BH-30 LR had my name on it! At 275,-USD these things are not cheap, but they are extremely well made. Like fine-art machinery if such a thing exists! Lastly I wasn't entirely happy with the "one size fits all" camera plate provided with the MeFoto ballhead neither. 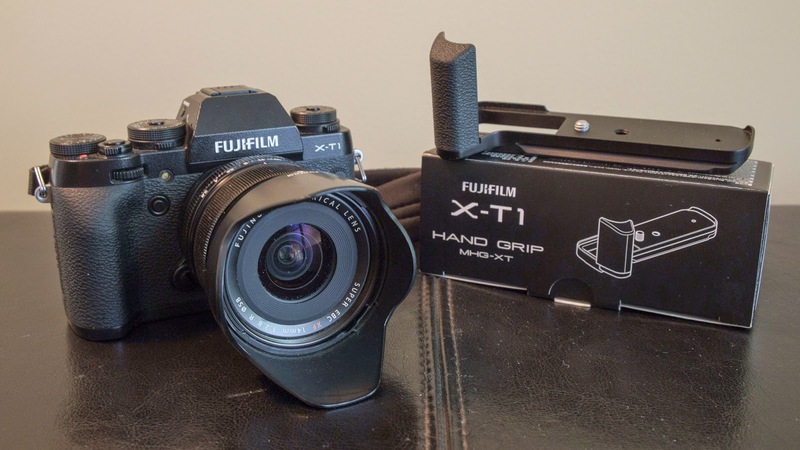 I came close to buying a full size RRS L-bracket for the X-T1, but eventually have settled on the MHG-XT (large) handgrip made by Fujifilm. Once screwed to the bottom of the X-T1, the battery can still be easily changed which is a huge plus compared to some of the earlier X-E1 grips. Beside the MHG-XT (large) adds a nice grip which is perfect if shooting the longer lenses such as the 55-200. I picked one up for 109,-USD at my favourite Fujifilm retailer in the UAE; Gulf Photo Plus. By the way, the "small" version of the MHG-T1 is identical expect that it doesn't have the rubber grip on the front. Even though an L-plate is great for shooting verticals (including panoramas), I eventually didn't buy one because I found it too bulky (and ugly, sorry RSS). Some issues that have been reported when using cable releases also made me revise my decision. As one can see in the image above, one is still able to shoot good verticals with the MHG-T1, by flipping the camera on the ballhead. 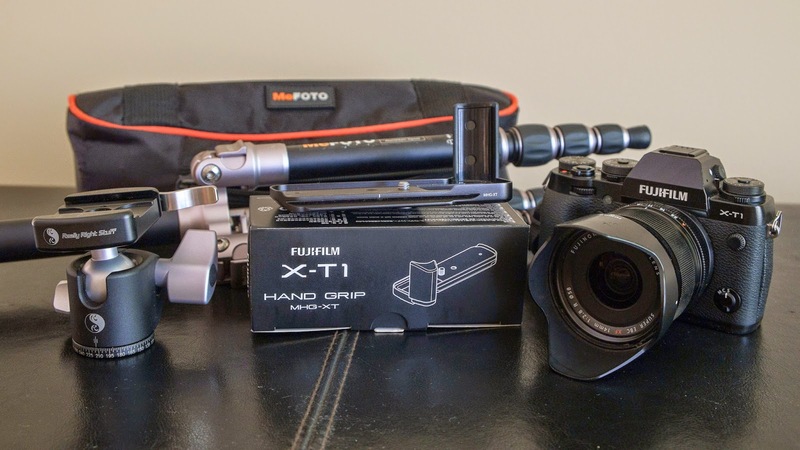 Adding everything up, MeFoto tripod, MHG-XT handgrip and the BH-30 ballhead; set me back just over 500,-USD; quite reasonable for a high quality but very lightweight travel tripod setup! While the total weight for the original setup without the camera was over 2.2kg, the new setup totals at 1.3kg. As I'm in the process of preparing my next photo-adventure to Burma/Myanmar next November, I know what tripod kit I'll be taking along! For the ones wondering, the tripod still fits inside the MeFoto carrying bag with the BH-30 attached. Remember, "Wherever you go, there you are". I did however have the opportunity to photograph an interesting project by one of my favourite Architects, Frank Gehry; who by the way, a few months ago, was a passenger on my flight from New York to Dubai. 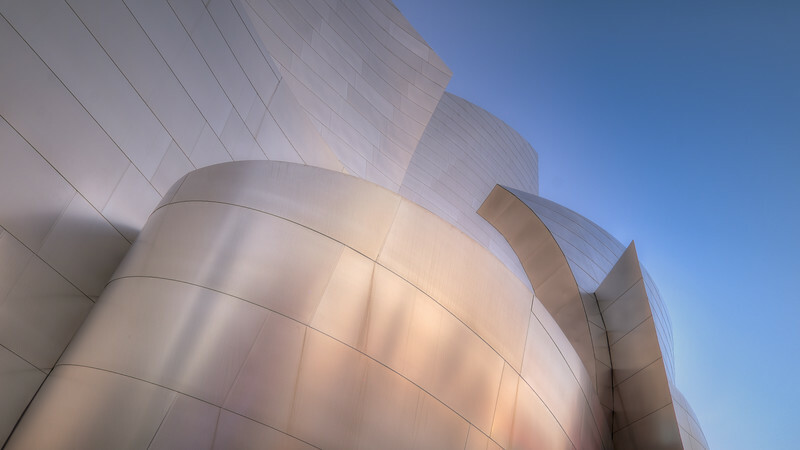 The Walt Disney Concert Hall in downtown Los Angeles (CA, USA), got its name from a large donation given by the Disney family. Although the project started in 1994, the concert hall, which can seat 2265 people, opened in 2003 after a delay due to lack of funds. Its shape reminds me a lot of another Frank Gehry design; the Guggenheim museum in Bilbao, Northern Spain. An interesting side story is that unlike the majority of the matt finish of the building, part of it (Founders room) was initially very shiny. With some neighbours complaining about excessive glare and heat; similar to the effect of a parabolic mirror, the solution turned out to be lightly sanding the panels causing the problem! More images of this amazing building can be found in a brand new Los Angeles gallery. To quote Mr. Gehry; " An architect is given a program, budget, place and schedule. Sometimes the end product rises to art - or at least people call it that way".